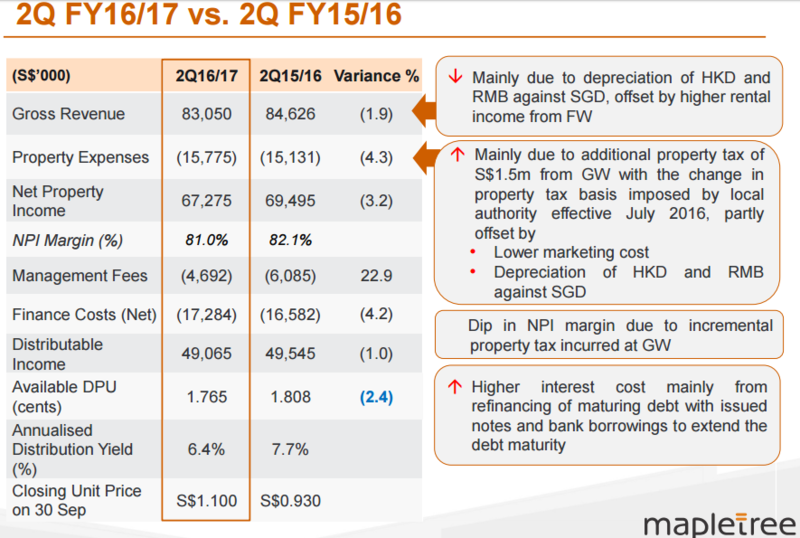 Mapletree Greater China Commercial Trust (MGCCT) a Singapore based REIT announced its latest quarter results on 27th October 2016. The REIT invests in a Shopping Centre in Hong Kong Kowloon area, a commercial business property at the heart of Beijing business district and commercial buildings in Shanghai, where the tech scene is vibrant. If you are not so much interested in the nuts and bolts of reading financial statements, do feel free to skip the first part. However, if you would like to stimulate your brain, and compare your review of statements with mine in the hope of knowing you have a more thorough process then do stick around. If you also hope to see if you are missing something in your review of the statements, do stick around as well. First, perhaps we can get the results out of the way. The result was a mixed bag. Expiring Retail Leases in Festive Walk, Hong Kong were renewed at 15% higher rental revision. This is much weaker than the 20%++ seen in previous rent revision. Expiring Office Leases was renewed at 7%. 51% of Gateway Plaza’s FY2017 expiring spaces have been re-let. Sandhill Plaza, Shanghai occupancy remained high at 99.6%. 37% of Sandhill Plaza’s FY2017 expiring spaces have been re-let. Overall, while the commercial supply have been tight in Beijing, it shows that business are slowing down, yet its surprising that MGCCT can still achieve positive rental revision. I could be wrong, but this might be the norm. Assuming that the current GDP growth for China is 6%++, an 8% growth for 3 years is not really a lot. In fact, we might not be keeping up with inflation in China. The word on the ground is that shop space in luxury as well as daily road side shops have much higher vacancy. MGCCT is doing well to still keep their high occupancy, though MGCCT investors like myself are weary that it might not be too long before they are affected as well. The objective of quarterly financial statements is a way for the management to update the shareholders, or prospective investors on the operation and management of the company. You can get the financial statements at www.sgx.com > Company Information > Company Announcements. Filter by the stock name and you can find the quarterly financial statements. Quarterly reports are thinner than an annual report, but nevertheless provide good information. If you are a prospective investor and a shareholder, you might focus on slightly different things. How was the previous results and in this report what is different? What are the differences that makes the most impact to the REIT? Does this REIT stand out for the better or for the worse? What are the evidence the management is doing a good / bad job? Here is how I typically read the quarterly report and the presentation slides. My focus is typically on the financial results, but I don’t have a huge preference over the presentation slides. If I am on the train, my system is to open the SGX announcement and start browsing. It is sometimes easier just to review the slides if the day job have killed much brain cells. The first section which is the Statement of Total Return and Distribution. We first assess the difference in distribution over the last quarter. Amount available for distribution was lower, compared to last quarter, however but not by much. The statement of total return and distribution statement shows the accounting income profit and loss of the business. the net income, which shows whether the business as a whole is making a profit or not. In this case, it is, and net income is higher. While net income tells us about profitability, for REITs, they pay out of cash flow instead of net profit. Normal business companies are often limited by the net income they make to pay out the dividend. If they make $0 net income, or losses, the business cannot pay a dividend. For a REIT they can pay out of cash flow, just like a business trust such as Rickmers Maritime and FSL Trust. 3. What makes up the different between Net Income versus Income Available For Distribution? Distribution Adjustments shows what are the NON CASH items that was taken out from the Income Statement, that can be added back, to form the cash flow that MGCCT can pay out as dividend. Just remember that in the income statement, there are much revenue or income made that is non cash, earned in the quarter and so they have to be presented in the income statement to reflect the actual consumption of the goods and services sold by MGCCT during the period. It does not mean they earn that net income in cash during this period. Distribution Adjustment answers your question why the REIT can pay more dividends then net income. In all, the adjustments for distribution is 2.6% lower. The reason to note is that, perhaps in the future, the baseline cash flow available for distribution may not be this higher (or this low). In the case of MGCCT, #3 is prevalent like most of the REITs. 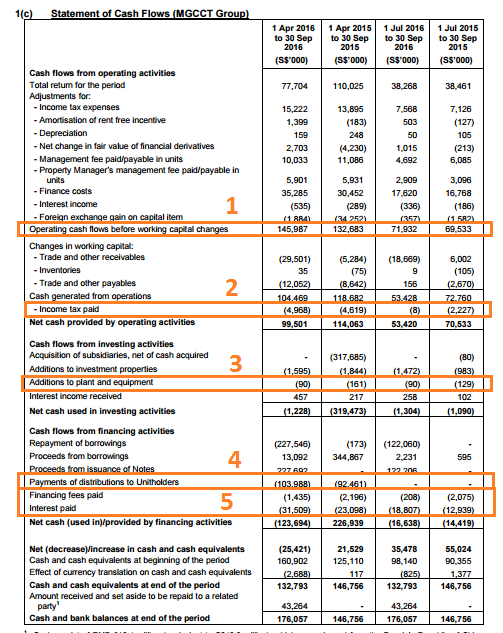 You can compare the 4.7 mil in this section against the 4.9 mil in the Statement of Total Return to see that management is collecting the majority of their management fees in units. This explains why income available for distribution is lower by 1%. We go next to see whether there are any explanations the property operating expenses are higher. Here you can see the revenue was impacted by the depreciation of HKD and RMB. This is perhaps balanced up by the foreign exchange gain in the Statement of Total Return. Here the management explains that the cost is higher due to additional 1.5 mil property tax incurred due to change in property tax incurred for Gateway Plaza. We will talk about this later. Next up, the Statement of Cash Flows. You might notice the pattern that I tend to spend more time going through the cash flows. This is to make sense of what is important, which is the business numbers. What is it different? What is the big item that stands out. For a REIT, the cash flow statement have less of an impact, compared to a normal business. This is because the Statement of Total Return and Distribution, will include a section that computes the Income available for distribution. It is my habit to go through this, just so to find out what is different. Cash Flow statement shows the actual cash flow going out and coming in to the business during this period. What is important to me is to compute the Free Cash Flow. 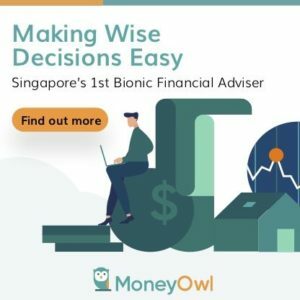 I wrote one article explaining all the different cash flows (over here), which you might want to read first before continue this section. In the case of REIT, their Free Cash Flow is also known as AFFO, or Adjusted funds from operations. Funds from operations (FFO) is usually computed as Net Income + Depreciation and Amortization – Capital Gains from Property Sales. AFFO is FFO – Capital Expenditures – Routine maintenance Amounts. If you look at the definitions Free Cash Flow looks really like AFFO. If the business do not product Free Cash Flow, or in this case AFFO, we don’t get our dividends. For myself, I tend to use a modified version of free cash flow, whenever I reader the cash flow statement. I would replay on Cash Flow before Working Capital (#1) – Income Tax (#2) – Maintenance capital expenditure (#3) – Interest expense (#5). This will give me a Free Cash Flow for the Business, or the cash flow the firm can pay out for dividend (which is shown as #4). You can compare this Free Cash flow for the Business versus #5 to see if they can pay the dividend. 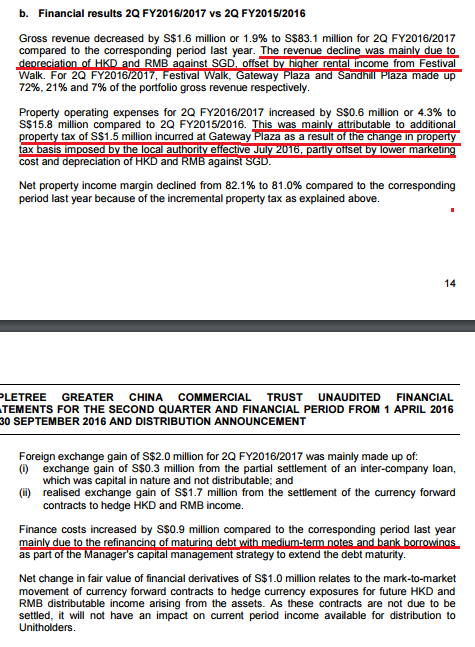 In MGCCT example, if we look at 1st Apr to 30th Sep or half a year, its Free Cash Flow for the Business is $145 mil – $4.9 mil – $0.90 mil – $33 mil = $106 mil. Compare this $106 mil to the $103.6 mil payout, it covers the dividend. Why don’t I include the change in working capital, which is the section between #1 and #2? Working capital refers to the changes in inventory, receivables and payable which affects the difference between the statement of total returns and distribution versus the cash flow statement Each business have their working capital to work out in the short run. In the long run, changes to working capital should nett to zero. When working capital is net to zero, the payable finances the inventory and receivables well. I do not include the working capital because it distorts the cash flow such that we cannot tell what is the recurring cash flow nature of the business. That is not to say I will blindly ignore working capital. I respect it. Once I figure out the baseline free cash flow, I check if the working capital over the years is ballooning. A big positive change in working capital shows signs that the business is using payables to finance their business. If that is the case what you want to do is ask why that happens. For REITs, working capital should not cause the cash flow before working capital and after to differ. A REIT do not have much inventory or receivables to finance and whatever payables can be well funded. 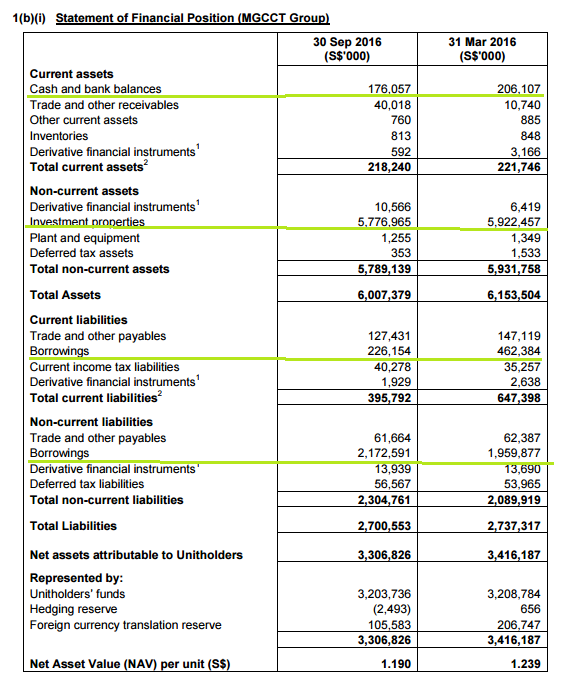 The balance sheet shows the financial standing or the net worth of the business. For a REIT there shouldn’t be much big changes, unless there are some acquisitions. Some of the things I catch is the change in Investment Properties shown here in the non-current assets as Investments Properties. I try to see if there are some major drop in the value of the properties, since REITs frequently revalue their assets. The other thing is what is the net debt to asset. This is to check financially how leveraged the company is. In MGCCT’s case, the net debt = add up long term and short term debt – cash holdings => $226 mil + $2172 mil – $176 mil = $2222 mil. The net debt to asset > $2222/ $6007 = 37%. The leverage have declined over the years from an IPO of near 42%. It remains within the 45% limit set by MAS. The second last section in the financial reports that I look at is the number of unit/shares outstanding. I won’t be able to remember how much shares was issued or buy back. By reviewing this section, it triggers me to find out whether they did a rights issue, a preferential offering or a share buyback. With the number of shares outstanding, it will also allow us to convert between market capitalization and price per share, income available for distribution versus income available for distribution per share. The last 2 section to read is the Review of Performance and Commentary of Conditions going Forward. This 2 sections tells us what happen last quarter in English and the outlook going forward. Next up is to look at the Slides that accompany the financial results. Slides prepared by different companies might differ, but they would usually mainly have a few things. Our job is to cut through the corporate speak, and pick out the things that reflects management ability. The slide deck usually starts of with one that compares the main return versus last year. Pick the one that compares this quarter to last quarter. If we want to compare the performance of this period versus last year, the we focus on this. We review what the management say are the major elephants in the room. In this case why the property expenses is much higher. There may be one or two slides that lets the shareholders or investor know how are each of the individual buildings, or on a larger scale, each country’s property is doing. In the case of MGCCT, they combine this, with the rent revision for the properties where rental is renewed. WE can see the weak one is Gateway Plaza in Beijing. The rent revision for most places are good. This portfolio occupancy slides allows us to assess whether there are any big changes from last quarter. 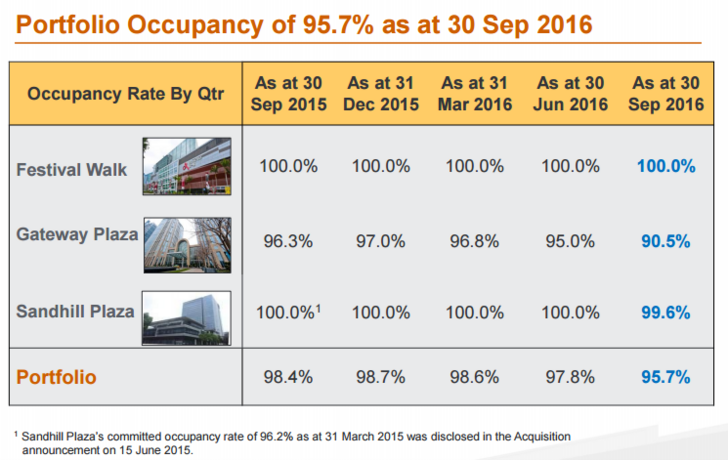 Particularly, we see for Gateway Plaza the occupancy have plunged from 95% to 90.5%. If we cannot find a more detail explanation, it will be one of the question to raise to the investor relations. The portfolio lease expiry profile shows us the percentage of properties that will be expiring soon. We can then match this to the forecast economic climate. If near term climate is good, does the REIT have more properties up for renewal? If near term climate is not good, does the REIT have less properties up for renewal? As we know this past year, the economy, particularly the fall in demand from China tourist is likely a big problem for MGCCT’s management to secure a good rent revision. 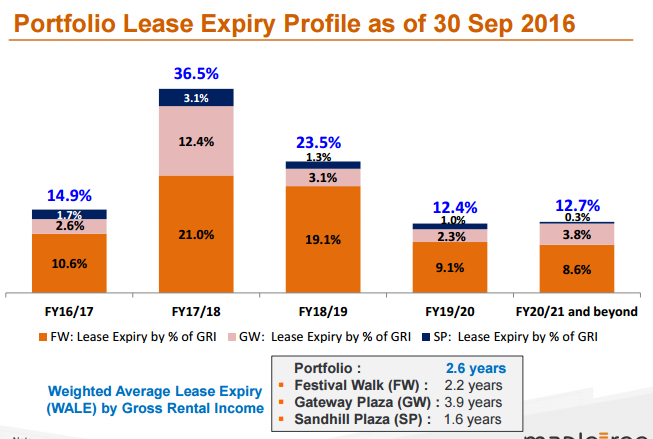 If there is a large amount of space up for renewal, this could have a big negative downside for the dividend per unit paid out. MGCCT has 15% of its portfolio expiring in 2016/2017. This to me is rather manageable. A REIT grows with debt leverage and equity. The job of a manager is not just to identify good properties to acquire, manage existing property, but also to tap various forms of capital at the right time, to maximize shareholder returns whole minimizing risk. Thus this section is for us to see if the manager is controlling the REIT’s capital risk well, while pursuing growth. 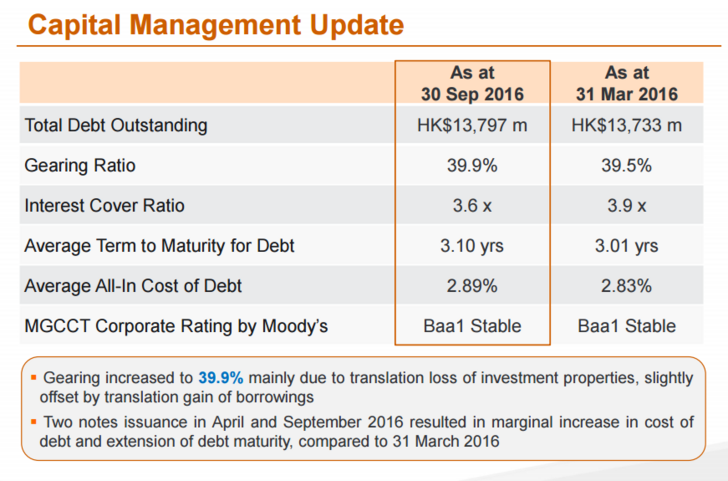 The capital management update is a very good snapshot of the debt management done by the manager. We need to assess the cost of debt and average term to maturity for debt. As I usually compute the net debt to asset myself, the gearing ratio is more of a cross check to ensure my figures are not too far off. The debt maturity profile shows us whether there are some refinancing risks coming up. Back in the great financial crisis, the REIT managers were less experience and didn’t think the credit market will be so dried up that refinancing debt can be so difficult. 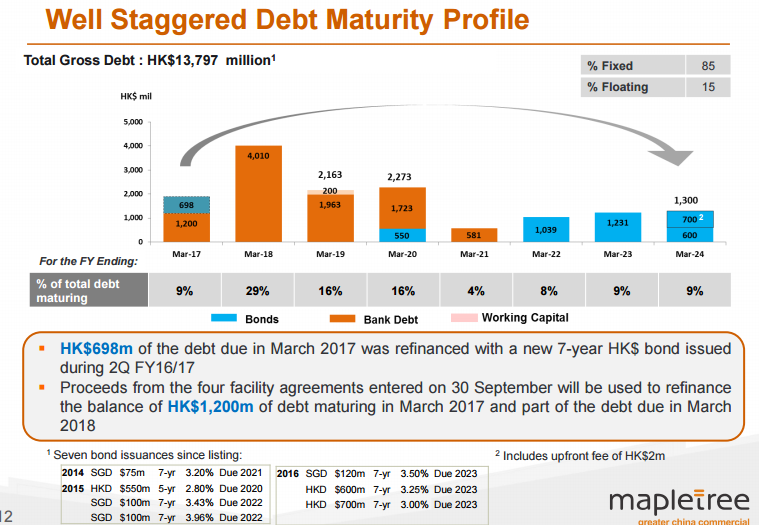 The managers have learnt well, and in the cast of MGCCT, we can see the debt maturity was rather spread out, which will mitigate the single year credit crisis. When you carry out a review of the quarterly result of a REIT, you have to bear in mind to put yourself in the position as an existing investor, but also as a third party prospecting the purchase of this REIT. MGCCT results were weakening. In the grand scheme of things, the rent revision looks good. If Gateway was re-let at a good rent, then this result could be higher instead of lower. Hong Kong, despite the rent deflation environment is doing well. The VAT or value added tax, have been in China’s history for long time. However, it has been reformed a few times. In its most recent form, the VAT is a tax on the supply of goods, the provision of repair, processing and replacement. The tax rate was between 13 or 17%. Business Tax was levied on other services, transfer of intangibles and immovable properties at a rate of 3% or 5%. The co-existence of business tax and VAT have created a whole host of problems, with double taxation be the most crucial one. At this point, it should be noted that if you are VAT compliant, or paying VAT tax, you would be able to input tax credit, to offset against output tax credit and thus, minimize your overall tax cost. This means that if you are a producer of goods and consuming some services for cost, you can offset your taxes. You cannot do this for Business Tax. In 2016 May, a circular was released stating that this VAT will be applied to all sectors, and Business Tax will be eliminated. This is called the B2V Reform, includes real estate and construction, financial services and insurance and lifestyle services (such as hospitality, food and beverage, healthcare and entertainment). 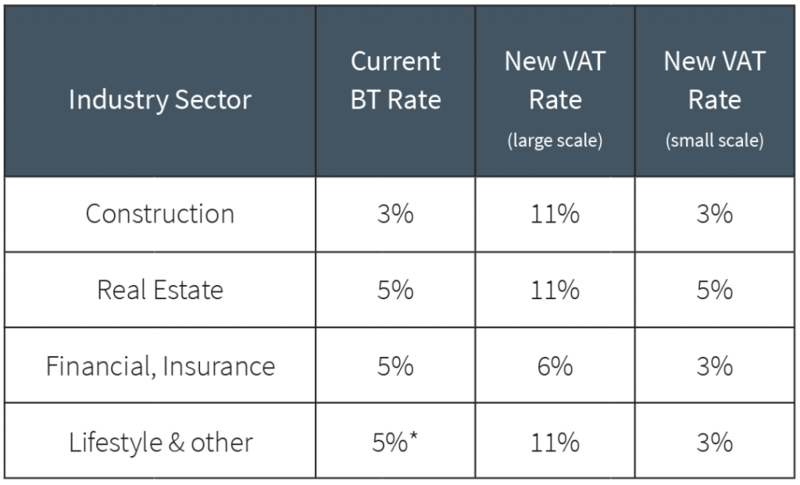 The VAT rates are differentiated for ‘general VAT taxpayers’ and ‘small-scale VAT taxpayers’. Taxpayers with annual revenue of more than RMB 5 million are required to register as a ‘general VAT taxpayer’. Taxpayers with revenue under RMB 5 million may register as ‘small-scale VAT taxpayers’. Small-scale VAT taxpayers are not eligible to claim tax credits and can only issue special VAT invoices through the tax authority. General VAT taxpayers may claim input tax from small scale business through special VAT invoices, issued by the tax authority. 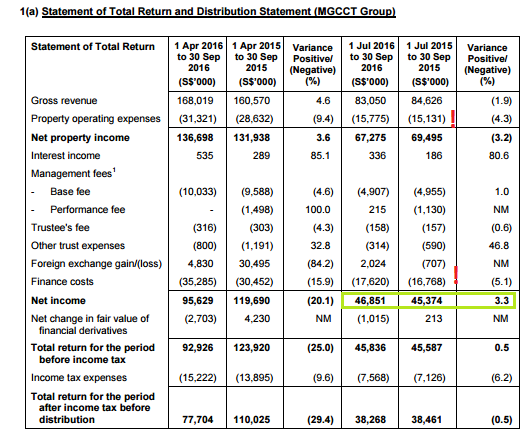 If we look at MGCCT results, we can see that the management commented the higher expenses was due to tax changes. 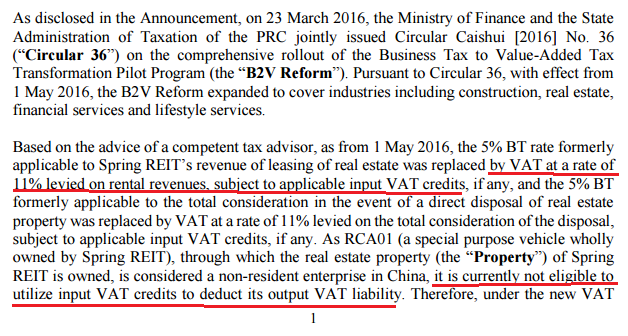 It is likely that instead of Business Tax, these China landlords are paying VAT..
VAT is rather like our Singapore’s GST, the producer hopes to pass on the cost to the consumers. Since the consumers themselves produce output, they are likely to be able to claim input tax credits, where they are able to claim back the input cost. This is so that these tenants won’t get double taxation. 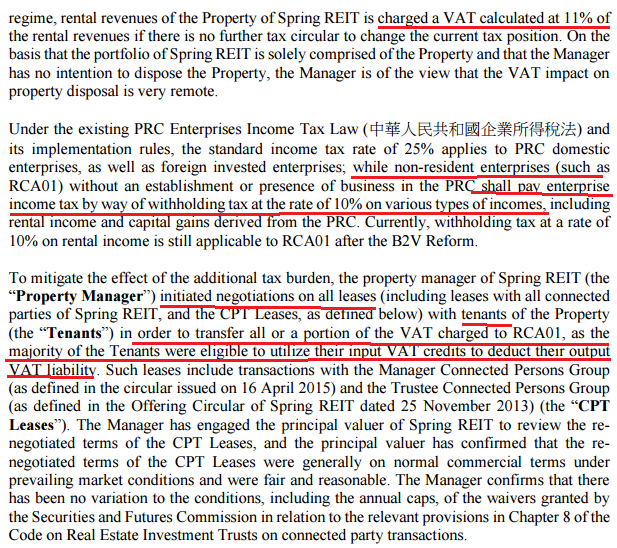 For example, before this rental reform, the rental agreed with a Gateway Plaza tenant is RMB 100. The tenant pays RMB 100, and this RM 100 is expenses in full. It would seem after the reform, VAT is better for the landlord. Before reform, the rental income to MGCCT is subjected to 5% business tax. After the reform, they are able to pass on the full cost to the tenant. In reality there are complications. To claim back the VAT, the tenants need to be VAT compliant. This will entail getting your IT systems to be VAT compliant and keeping track of your input and output credit. Not all firms are able to do that. Some firms will opt for a simple business registration and they won’t be able to claim back the tax credit. What this means is that not all will agree to see their rent increase by 11%. They are also affected by B2V reform. However, they have provided updates. 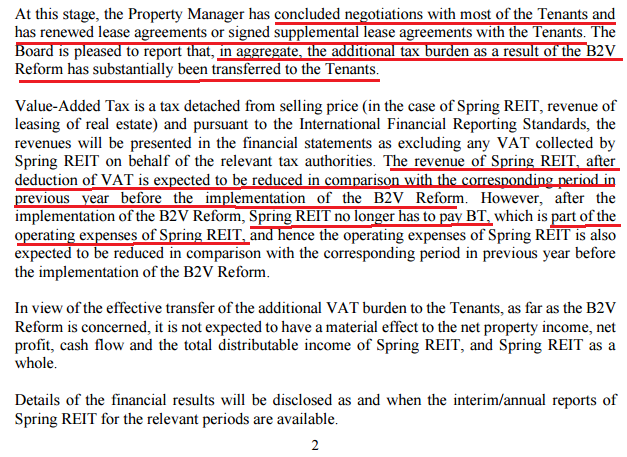 Spring REIT have provided a very clear update, which we hope MGCCT was able to as well. What I find it puzzling is that the VAT affects the revenue while Business Tax affects the operating expenses. If we look at MGCCT figures, the explanation is that operating expenses are higher due to then change in taxes. This contrasts well with Spring REITs explanation. When we prospect on business, we have a tendency to outsmart ourselves and think, just because a tax that is newly declared exist, then this change is due to VAT. The higher operating expenses was mainly attributable to the additional property tax of S$1.5 mil incurred at Gateway Plaza due to a change in property tax computation basis. Property tax is now computed based on 12% of revenue, previously it was computed based on a percentage of the historical cost of property. The property tax is not a new tax. Just that the computation basis has changed. IT used to be based on cost now its based on revenue. This debunk my VAT theory and in this example its good to try your best to confirm your gut feeling. If we look at this change in taxation, this is not good news. historical cost after the recent years improvement in rentals, would be lower, and if the tax is levied on the historical cost, then it would be lower. This looks a big impact to MGCCT, and perhaps the reason why the share price have taken a beating. On VAT, pending clarification with authorities, we have provided for 11% VAT in both 1Q FY16/17 (since May 2016) and 2Q FY16/17. The decrease in cash balances by SG$30.1 mil and increase in trade and other receivables by SG$29.3mil as of 30th September 2016 was mainly attributable to the VAT implementation at GW. On the surface, the result of MGCCT does not look drastic. However, when I reviewed the results of some of the recent REITs, I observed some tell tail signs that the market participants are looking at MGCCT in an unfavorable manner. Both Aims Amp Industrial Trust, Cambridge, announced what I felt are poorer results. Yet the share price remained strong while this result announcement resulted in a near 10% fall in MGCCT’s share price. Taxation, is a way where the income available for distribution can be shaved easily if the payout is so high. There are much dark clouds overhanging this REIT, and what is keeping this REIT on my radar is that the rental revision is positive. 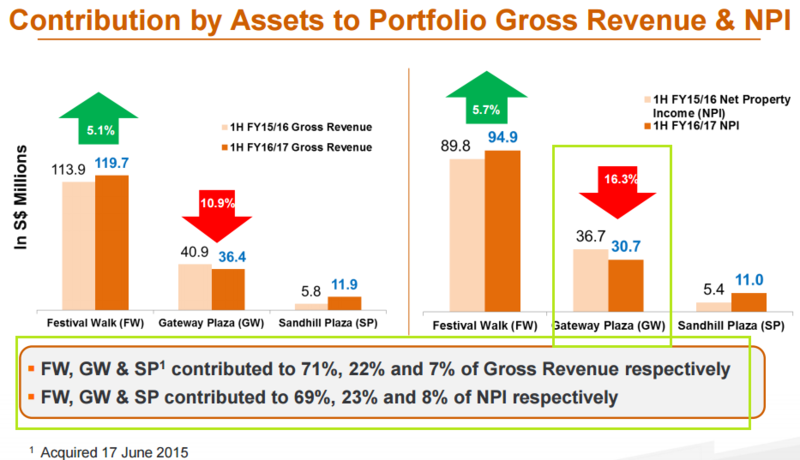 With 10.7% of Festive Walk expiring next year, it will be interesting if they can still achieve this kind of positive rental revision. I hope that you find the review of the quarterly financial statements useful and if you like tear down this way, do let me know so that I can find time to do more of these. There are some aspects of prospecting that is not covered here and can be added to your work flow after reading the financial statements. The biggest being doing some reading on the actual jobs growth and population dynamics of the Hong Kong, Beijing and Shanghai region. I have also show that, we often have some hypothesis and while its good to think out of the box, choosing to ask questions to the management might clarify that our hypothesis might be wrong. Thanks for the helpful explanation on the cashflow. I have a beginner question. Is it normal for the actual payout to exceed the amount available for distribution? Or is it better to pay out less in order to pay back loans instead? hi Anon, its always better to pay out less. in a normal business that would be paying less than free cash flow, or paying less than net income. they can pay higher due to the REIT structure, but there are some quarters they can pay out more, which was the cash flow taken from another quarter. over the long run, if they keep doing this, you should worry. quarterly result’s objective should be: take note of this and lets revisit in the next review. Just to share that they are not paying more than the income available, based on the figures stated above. The 103,988 k is paid from available income in 4Q15 and 1Q16 which is 104,290 k.
hi JW, thanks for correcting my mistake. we should be seeing if the income distributed matches that of the last period. Thanks for this wonderful article. I now have more tools to evaluate REITs with. Just curious, what other articles/books/websites would you recommend for REIT education? I’ve read Bobby Jayaraman’s and Ralph L Block’s REITs books and am hungry for more. How did you develop/increase your competency in evaluating REITs? Hi Unintelligent Nerd, your nick is a strange one firstly considering the things you messed with. Secondly both books are great and I think the next step is to read a mixture of financial reports from the brokerages, without looking at the target price, but also thinking critically about these REITs. Ask more questions that comes to your mind. When i start i try to picture myself as a person managing 3 properties, look at what presented and try to be a bit skeptical there. Some of the bigger lessons you will learn is when there is an acquisition, done by way of rights issue, preferences shares or debt. through a few rounds of evaluation, it will sink into you. Also good is google “REITs bad, dangerous” and then see what it throws up! Believe this write-up will be very helpful for me to start looking at my portfolio & watchlist of REITS more objectively. hi dpang, hope this helps. I hope i could have the time to come up with more stuff like this. Great post for such a detail explanation on analyzing a financial report of a REIT , I really learn a lot as a non- accounting background…thanks! hi STE, thanks a lot. over time i think many have told me the struggles and even for myself, i realize i have to force myself to understand more even some of the things i am not sure about in reports. for non accounting folks like myself, there is always things i am not sure about. V comprehensive analysis, taking care of even those readers who might have next to zero knowledge about REITs, like myself. I think you meant “wary” instead. LOL. My personal, layman, unvested view of REITs: it seems like the retail heavy REITs are all getting screwed of late and the prospects look terrible. Not just in the local market but the region as well. This is just my own unsubstantiated observation, and from comments from friends…is that true? Hi TTI, you are right that i meant wary. My English have always been a problem. Retail malls is an old concept in the age of Qoo10, Amazon, Taobao. That is why if you notice many of the malls are turning to anchor tenants like eateries, cinema and supermarket. still different country have a different culture. the malls in Singapore are along those transportation lines and serve as a place where, in the hot Singapore climate, somewhere they can have a good meal and meet up. It shocked me some times to see how crowded the malls are. I went through that period where I think ecommerce is going to be the future of shopping and I think the trend will continue. The worse case is really, when amazon comes in and same day delivery becomes a culture. The death of retail REITs will be when people don’t want a place to gather and have a meal. Still, even if they do not die, their rents will buckle. I can have 2 stance, one is guess that what i research will happen and stay out, or that I can see whether the numbers are showing things happening. I chose the latter. The retail scene might change to an extend that the retail operators will only need a smaller place as a place for the folks to feel the goods such as clothes, and you can order online and deliver to the customer. The online shops in this case will move to have a brick and mortar presence. But will not take up more space. One of the usa chains that is showing this way is MACY. This is really good Articles. I had spend the last 2.5 hours going through your article in detail and i had really learn quite a bit into reviewing the quarterly report. Keep up the good work, Kyith. I would love to see and learn more from these articles. Hi BK Tan, thanks for the support! If there are folks like yourself who finds these articles useful that they level up your competency, I will be more motivated to write more haha. Your post has made me interested in MGCCT, and I took a quick look at it. One thing which stands out is the relatively short land lease left on the properties. I calculated that the average lease left is 33 years, weighted by valuation. If we take a straight line depreciation of the investment property valuation of 5.9 billion, the annual depreciation is about 180 million! The free cash flow (after adjusting for management fees paid in units and interest expense) is about 187 million in the latest FY. So it seems that a large part of the distribution is capital return. May I know your thoughts about this? Hi Goh, you hit the nail on the head. And I can see you even add the management units back in. The case becomes weak, when we realize that to renew the land lease in China it might not be Singapore expensive. However, for Hong Kong, where much of the value of MGCCT is held, may not be so cheap. In fact this is one grey area everyone asks. So you can say I am investing in something that have a huge return of capital. But i struggle to get pass that these things do have a cap rate so the return of capital should not be that much. What do you think? Hey Kyith, thanks for the reply. You have a point that renewal cost of lease may not be same as the valuation. I guess only way is to ask IR. I asked CRCT IR about their lease, which is also quite short, but they couldn’t give a figure because there is no precedence so far of lease expiring. If we divide npi by value of investment property, the cap rate is about 4.6% if I remember correctly for mgcct. Not sure how that compares with properties in China and HK. We may also need to consider the useful life of the building. Is 50 years considered reasonable? After that, there will be significant capex to rebuild, even if land lease is renewed. For example, funan centre was built in 1985, and after about 30 years already it’s getting rebuilt. hi goh, i think i might have some blind spots here. I vexxed my brain hard on what you went through and i can’t pin point a good conclusion. yes a building deprecates over 50 years and even before that i suppose every 10 years they need an AEI. usually the AEI they look for an ROI of 10%. if they do not do ROI they will face problems. such is the case of REITs. but they could borrow to do the AeI and AEI enhances the asset value. end of the day the land lease will come into factor. the question is when. already there are acquaintance that says, since mapletree purchased festive walk it has look abit dated. but part of the property value can be the rent that it could bring in, which is a function of the vibrancy of the place as well. i don’t understand on the increase ~30m in trade and receivable due to VAT implementation. Wouldn’t trade and receivable is something the company will receive from the 3rd party however in VAT case, wouldn’t this for mapletree to payout to the government? how it can end up in trade and receivable? hi Starix, thanks for asking such a tough question. It is tough because I can only give you my best guess as I am not always great with tax things. My take is what they explain is different. 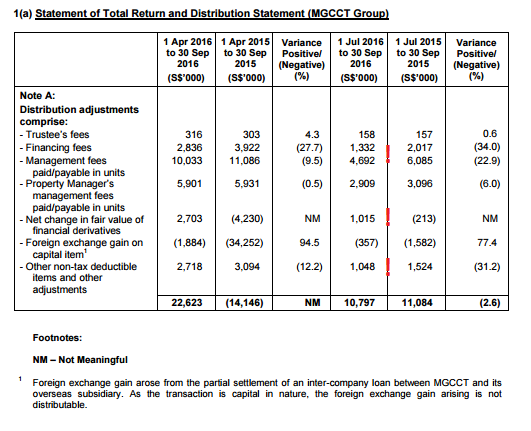 The decrease in 30 mil in cash is MGCCT paying the tax, and the receivables are the portion where they manage to transfer the taxes to the customers. If not it doesn’t make much sense! Thank you for this detailed post, I have been trying to mirror your analysis with my other REITs. For your section 4, regarding AFFO, I’m a bit concern that all my REITs, their AFFO are all lower than distribution paid. Could you explain more if this is a big concern and what other ways they could actually use to pay for the shortfall which the AFFO can’t cover? Can I know your thoughts on Hui Xian Reit listed on HK ? The dividend yield looks attractive at close to 9%, good occupancy rate and net property income still manage to grow slightly since y-o-y. Despite main operations coming from retail which is in sunset now, the earnings looked resilient. Appreciate your views if there s anything I missed out.